The Prime Minister Narendra Modi in his two countries trip for 7 days reaches at first halt Dublin Ireland. It’s first visit in 60 years of an Indian PM. The maiden visit of this country was in the year 1965 which was performed by first Indian Prime Minister Pt. Jawahar Lal Nehru. Enda Kenny Irish counterpart meets with and presents Irish cricket jersey to PM MODI. The Prime Minister Modi will leave for America after passing a day in Ireland. He will address the conference hosted by UN on 25 th September. The conference will be organized up to 27 th September. There will be participant delegates of more than 150 countries in this conference. PM Modi will visit San Francisco city during his journey, where he will have meeting with Barack Obama president of USA. The Prime Minister Modi has no official schedule to meet with Pak PM Nawaz Sharif; however they are about to stay in the same hotel of New York. The topic of skill India, digital India, food processing industry including the field of education will be discussed on cooperation with Enda Kenny PM of Ireland. During the visit of a day he will meet with 26 thousand Indians. 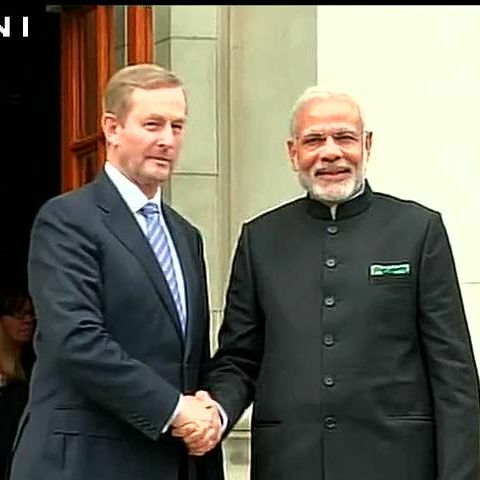 PM MODI expects to develop a strong economy relation with Ireland. Pm Modi on Wednesday will leave for New York from Dublin. He will participate in the 70 th session UN’s general meeting. He will emphasize there on 'the digital India and the make in India' campaign. Prior the Pm’s visit to America the defense related cabinet committee has issued purchasing ordered worth 2.5 million dollars to buy from Boeing company 22 Apache attack helicopters and 15 Chinook heavy lift helicopters. Russia had offered its MI-28N Night hunter and MI-26 heavy Lift helicopters, but American helicopters won the tender competition. Pm Modi will meet with the authorities of Microsoft, Pepsi and Apple including CEO of 50 companies. Pm will reach Silicon Valley on 26 th and 27 th September where he will meet with Mark Jakerberg. Modi will also meet with Sunder Pichai in Google headquarter.